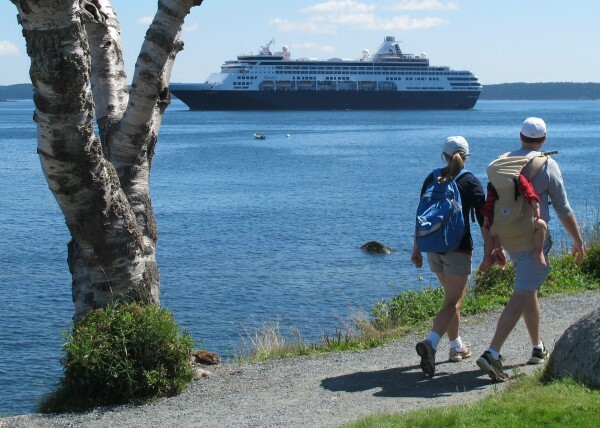 A couple carrying a small child stroll along Bar Harbor's Shore Path on Sunday, Aug. 4, 2013 while the cruise ship Maasdam sits anchored offshore in Frenchman Bay. According to information recently released by Cruise Lines International Association, direct spending in Maine by the cruise ship industry increased from $45 million in 2011 to $46 million in 2012. Tourists relax in Agamont Park in Bar Harbor while the cruise ship Maasdam sits anchored offshore in Frenchman Bay on Sunday, Aug. 4, 2013. 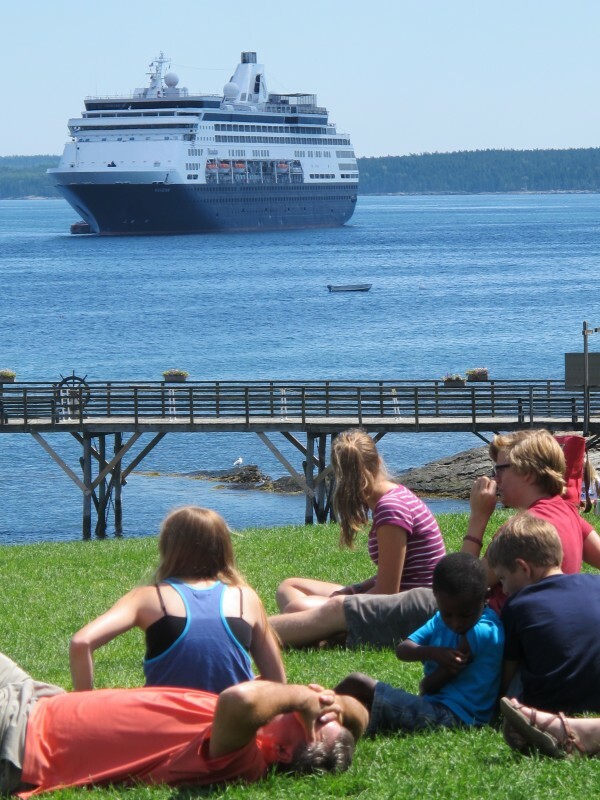 Each year, the Holland America ship visits Bar Harbor more than any other. BAR HARBOR, Maine — The tide of the cruise ship industry’s impact on the economy continues to rise in Maine, according to a cruise industry trade group. Cruise ship companies that include Maine ports in their itineraries collectively contributed $46 million in direct spending in the state in 2012, according to information released last week by Cruise Lines International Association. That represents a $1 million increase in the direct spending the industry had in Maine in 2011. The $46 million in direct spending generated 801 jobs in the state and wages totaling $27 million in income for Maine workers, according to CLIA. The $1 million increase in direct spending by the industry in Maine is not as significant as it was from 2010 to 2011, when it jumped 25 percent, from more than $36 million to $45 million. But an official with CruiseMaineUSA, a quasi-public entity that promotes Maine as a cruise ship destination, said any increase in industry spending is always welcome. This year could be the busiest ever for Bar Harbor, which is the state’s most active cruise ship port. Bar Harbor had 108 cruise ship visits last year, a record number, between early May and late October. Between May 5 and Oct. 30 this year, cruise ships are expected to glide into Frenchman Bay off Mount Desert Island 135 times. Portland, the second-busiest cruise ship port in the state, is scheduled to have 58 cruise ship visits between early June and early November this year. Portland had 58 cruise ship visits in 2012, 65 cruise ship visits in 2011 and 71 in 2010. Despite the decrease in number of visits, more of the ships visiting Portland have been larger ships, which caused the number of cruise ship passengers that have visited Portland in recent years to increase, according to city officials. Other smaller ports received fewer but regular cruise ship visits through the summer, particularly from the smaller American Cruise Lines ships that travel up and down the Maine Coast. On Sunday morning, the Holland America Lines ship Maasdam dropped anchor off the shore of Bar Harbor for the 13th time this year. Maasdam, which is more than 700 feet long and can carry upward of 1,200 passengers, consistently visits Bar Harbor more than any other ship each year. According to a HAL company blog, the ship’s frequent visits to Bar Harbor were officially noted on July 19 when Gov. Paul LePage visited the ship during one of its stops off Mount Desert Island. Other state and local officials accompanied LePage as he and the ship’s captain, Arno Jutten, exchanged symbolic gifts and thanked each other for the mutual support between the ship, local and state officials and Bar Harbor businesses — “particularly lobster fishermen,” the blog post indicated. Powers noted in her statement that Maasdam and other HAL ships that visit Maine, which include Eurodam and Veendam, began this spring to supply beer brewed by Maine-based Shipyard Brewing Co. on all of their ships that travel the northwest Atlantic coast between the U.S. and Canada. The HAL ships also regularly buy fresh Maine lobster to cook for their passengers, she said. Powers said the increasing number of cruise ship visits and passengers in Maine reflect the state’s “authentic tourism product” and its key location between the cruise lines’ Northeast homeports in the U.S. and their destination ports in Canada.